Putting information on a single page can be incredible useful if done right. While the trend is towards modeling, we argued before that documents still have their place. A one-pager is compelling, as there really is no excuse to read it. Unless you are using 3 Point font, you should be able to read and understand it in five minutes. It is also really easy to maintain and keep up to date. Read on to learn how you can create a one-pager, what templates exist and what benefits there are. Where is the pain? A one-pager makes sense, if communication does not work well. To see whether it is useful, articulate the pain. Do groups speak different “languages”, i.e. marketing and engineering? Or are they separated by space (different sites) or time (timezones)? Or do they need a common, concise view on shared information (e.g. interface descriptions or processes)? Once you are done with your concept for the one-pager, check whether it really addresses the pain. Who is involved? Make sure you distinguish between creators and readers. If there is more than one creator, you have to address alignment and ownership. With respect to the readers, they all must be able to understand the “language”. If you use a formal notation like UML on your one-pager, ensure that all readers understand UML. What is included? One page is not much space, so only include what helps ease the pain. By definition you have to leave something out, probably a lot. Always keep the first question in mind: Where is the pain, and does what you include address the pain? Often you can omit details. For instance, you may include a process, but not the process details. Make sure that the references to the actual information are unique. The process name should allow the reader to quickly find the corresponding process documentation. Powerpoint: There is nothing wrong in using Powerpoint (or LibreOffice Impress) for a one-pager. The software is available (almost) everywhere, and you can arrange items on the page as you see fit. Everybody knows how to use it. There are a few gotchas: You need a single owner of the document, at least we have not seen successful Sharepoint collaboration. (For Powerpoint-like collaboration, Google Slides work much better). Also, always produce a PDF for sharing. Once you share an editable document, someone will inevitably modify it. Even with PDFs you will end up with outdated versions floating around. Whiteboard: A whiteboard is great if everybody is in one place. But it can even be useful if the readers are elsewhere. We have seen teams that have a webcam pointed to the whiteboard, allowing remote team members to see it in real time. Specialized Collaboration Tools: Be careful when using specialized tools. Often you loose the conciseness of one page, and they often also constrain what you put on the page. Still, if you know exactly what you need on your one-pager, this can work. If you are using the Business Model Canvas (see below), then you can use Strategyzer to collaborate. Last, there are many templates to get you started, as an alternative to shaping your own one-pager. A well-known template is the Business Model Canvas, which has been developed for capturing a complete business model on one page. The business canvas has inspired many other canvases for other purposes. Chances are good that you find what you are looking for by searching the Internet for that topic, together with the word “canvas”. For instance, systems engineers may be interested in the System Footprint. You can use these templates “as is”, and some are quite mature. But more often than not, you’ll use the templates as a starting point, and tailor them as you see fit. The web is full of examples of business canvases, and the inventors also published a book that has many good examples. One impressive example for the readers of this blog is the use of a one-pager by WikiSpeed. In the video below, Joe Justice talks about this at 51:13 (the video will start there), where he describes how a one-pager ensures consistency between the modules of a car that is build in agile one-week sprint cycles. 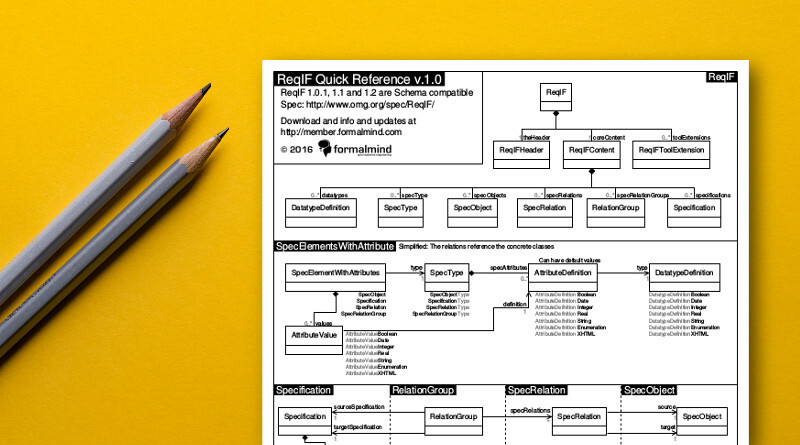 Another example is the one-pager that you can download at ReqIF.academy that provides you with an overview of the ReqIF Standard. This is quite different yet again, as this changes rarely, as the standard changes rarely. One-pagers are a great tool for improving collaboration. if you heed the three question in the beginning before using them, they can be a great tool for making your team more effective.